From the primitive ice buckets of yesteryear to the modern day refrigerator, the technology we use to keep our food cool has evolved. Yet, even though the methods have changed over the years, the basic principles of cooling have been the same for centuries and we have always used a cooling substance and some form of insulation. Whereas early systems might have used ice as the cooling substance, today we use chemical refrigerants. Refrigerants work by moving through the refrigeration cycle changing from gas to liquid and back again. Early refrigerants posed risks but the R-134a and R-600a refrigerants used today are non-corrosive, non-toxic, low cost, and environmentally friendly. Insulation is another important element of a fridge as it keeps the warm air outside from penetrating the cool atmosphere of the fridge. In times past, the insulation was simply the ice bucket itself, or the stone wall of an archaic ice house. Now, a more sophisticated type of insulation is used whereby a urethane foam and VIP (Vacuum Insulation Panel) maintain the temperature of a refrigerator. At its most basic, a refrigerator consists of four main parts that together work their magic to produce refrigeration. Samsung is reinventing the fridge by developing Twin Cooling PlusTM technology, first introduced in 1995. The Samsung Twin Cooling PlusTM adds new levels of convenience and innovation with its two evaporators that manage the fridge and freezer space separately to minimize temperature fluctuation. This makes it possible to control optimal humidity and temperature because moisture in the fridge can remain separate from freezer. A higher humidity up to 70% preserves food for longer so this is a welcome addition that minimizes food wastage. 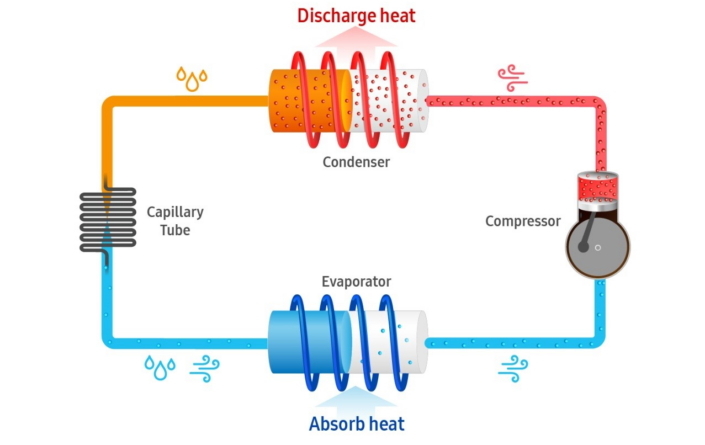 Additionally, in conventional – single evaporator – systems, odors from the fridge can be permeated to foods in the freezer because air from the two compartments is interconnected. Twin Cooling PlusTM fridges, however, prevent mixed odors that taint the ice you store in the freezer because twin cooling systems prevent air transition between the two compartments. 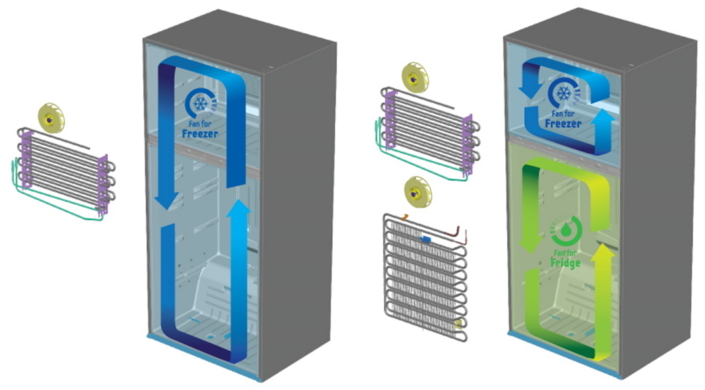 Fridge flexibility is another bonus that users can make use of with Twin Cooling PlusTM . It offers a range of options that enable users to customize their fridge in a way that best suits them. They can even switch off portions of their fridges to save energy. This is done through the separate cooling evaporators for the fridge and freezer that enables users to choose from five modes of operation: regular mode, energy saving mode, vacation mode, fridge max mode, and mini fridge mode. 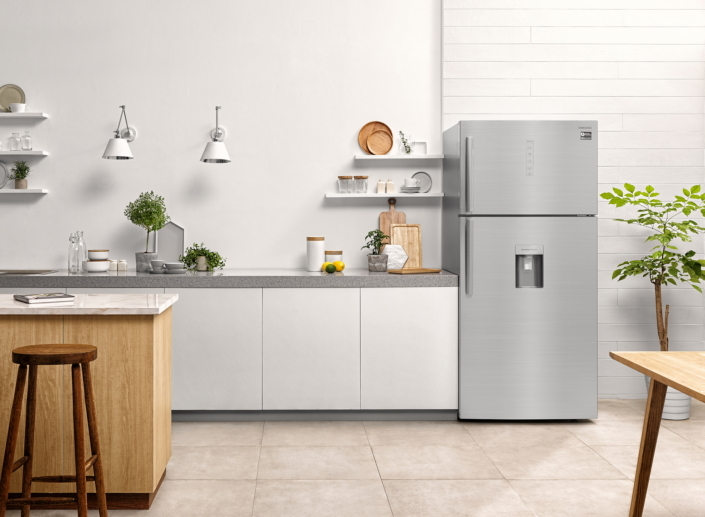 With Twin Cooling PlusTM technology now an established feature in Samsung fridges, the range of available products has grown to accommodate the different consumer needs. 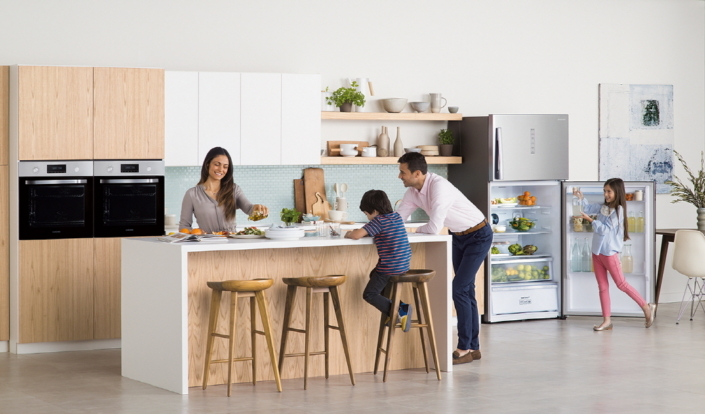 There’s the side by side refrigerators, the bottom mount fridges and top mount fridges – all with their unique benefits and features. Then there’s the T-type refrigerator – a world first Samsung. It’s the only Triple Cooling and dual compressor fridge in the world. Each zone can be controlled independently and maintain optimal high humidity levels. The fridge has come a long way from the early days of inefficient appliance with limited capabilities. Samsung is now at the forefront of rethinking the fridge. As a result, it will get more efficient, offer better insulation, more space and it will get smarter. The fridge no longer needs to be forgotten about – it can be embraced and interacted with in new ways.